Vauban was always very close to the people, to the peasants. He spent his childhood in the Morvan as a rather poor country boy, playing with the children of the village. 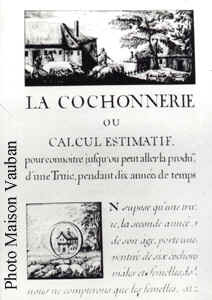 Because he travelled all over the kingdom, Vauban had quite a good grasp of humble matters which he describes in several writings such as the Geographical description of the Vézelay district or in Pig matters - in which he tries to estimate how many pigs can be descendant of one sow in 10 years time. In these writings, Vauban emphasizes the economic problems of his times, the peasants' hard conditions of living and he also suggests solutions which are always backed up with detailed statistics. Although a catholic Vauban denounced some decisions and ways of the Clergy ,who though closely linked to the King, often served their own interest before that of the Kingdom or of religion. 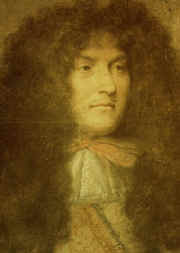 Vauban openly opposed the repeal of the Edit de Nantes, decided by Louis XIV, in 1685, in In Favour of the Huguenots ( Mémoire sur le rappel des huguenots). He even wrote to the King , asking him to restore the protestants' freedom, but his letter remained unanswered. Also Vauban encouraged the practice of religion in the army and asked for a Sunday rest for the soldiers. Vauban seldom met the King. Louvois, Minister of war, was the go-between, who talked to the King on behalf of the engineer. 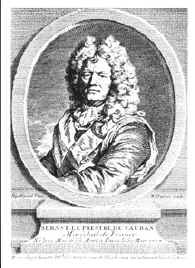 Vauban did not have a political role although in some of his writings he put forward suggestions to reinforce the King's authority and improve the functioning of the state, e.g. the court and the King's counsellors should not be chosen according to their birth, but according to their knowledge and their abilities. Vauban denounced the power of women at the court who used their charms to obtain favours that were often unjustified. He was far from being a courtier, yet he was a loyal servant of the kingdom of France and the King.